This last 15 years on the road I've been keeping a mental record of how many unsurfed, unnamed waves I've seen with my own eyes. I'd guess it's between eight and ten thousand. In crowded, pissy lineups I just think of that, and things are okay. 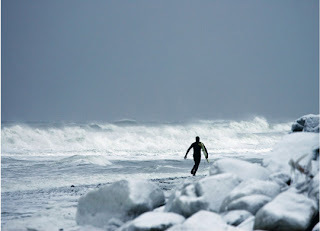 This photo tells the rest of the story of surfing in Homer, Alaska. Gart Curtis is so stoked there are finally waves, that he's charging through a frozen beachscape to get to some beachbreak with onshore winds before we lose our little dose of mid-winter light. ?